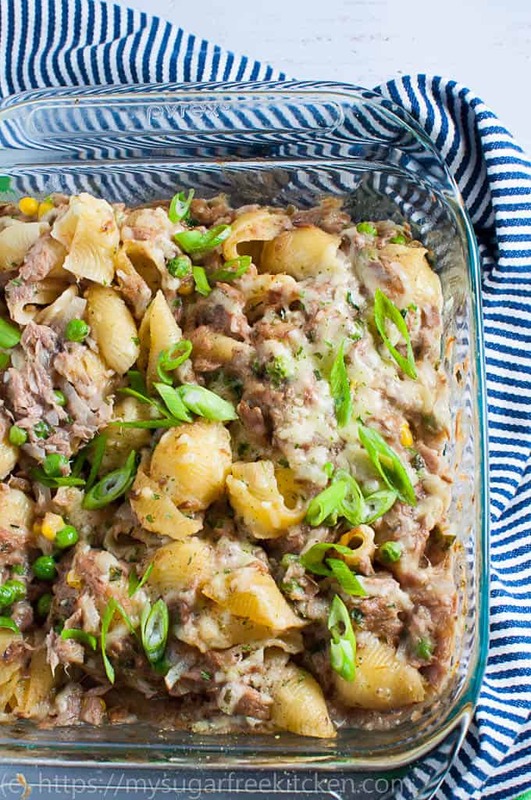 A creamy Tuna Mornay Pasta Bake without milk or cream! Who would of thought. 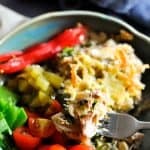 Instead I used Cream of Mushroom Soup to create a nice full creamy flavour for this tuna mornay which I then turned into a pasta bake with a light sprinkling of low fat grated cheese for a light and delicious indulgence. I have always been a fan of tuna, sometimes even eating it straight from the tin. Not because I especially loved the taste, I think it is more because I understand and appreciate its nutritional qualities, like being high in protein, and full of good omega 3 oils. 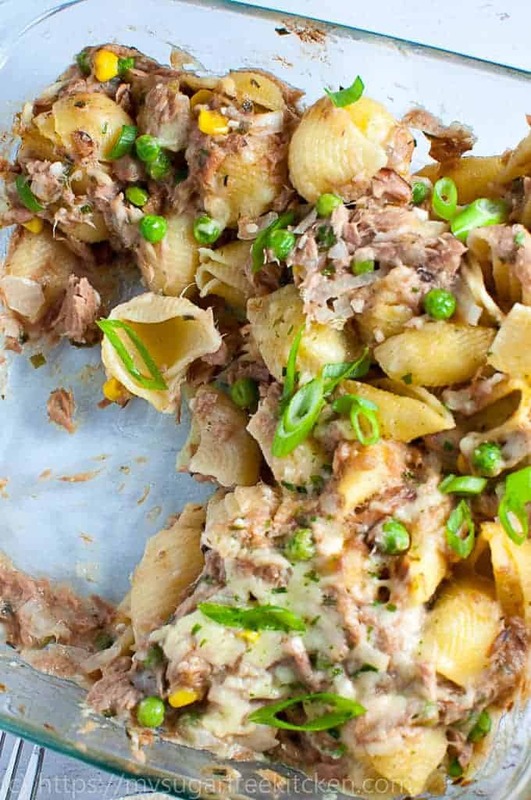 But you know, it is even better when made into a tuna mornay, made with cream of mushroom soup, some garlic and onion, corn and peas. Yum! 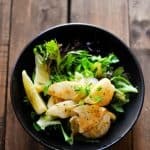 Some of my other favourite seafoods to cook are squid and salmon, and this healthy salt and pepper squid salad I made a couple of months back was out of this world! Back when I was working in the fitness industry and I would often do upto 3 to 4 hours of fitness training a day and I would eat a lot of tuna pasta bakes as I found it really helped to give me energy to get me through long days of work and workouts. My day often consisted of taking a group fitness class at 5.30 am, going to my corporate job at 8am, then taking more group fitness classes in the evening at 5.30 pm, 6.30 pm, and sometimes even 7.30pm. Wow, that is a lot when I think back on it now. I sure don’t miss those days burning the candle at both ends! These days, I like to take things a little easier, but I still have to have my workouts, but instead of 3 or 4 a day, it’ll just be 1 workout, often a cycle HIIT, or a cardio/strength HIIT. I think I might be slightly addicted to these types of workouts at the moment! 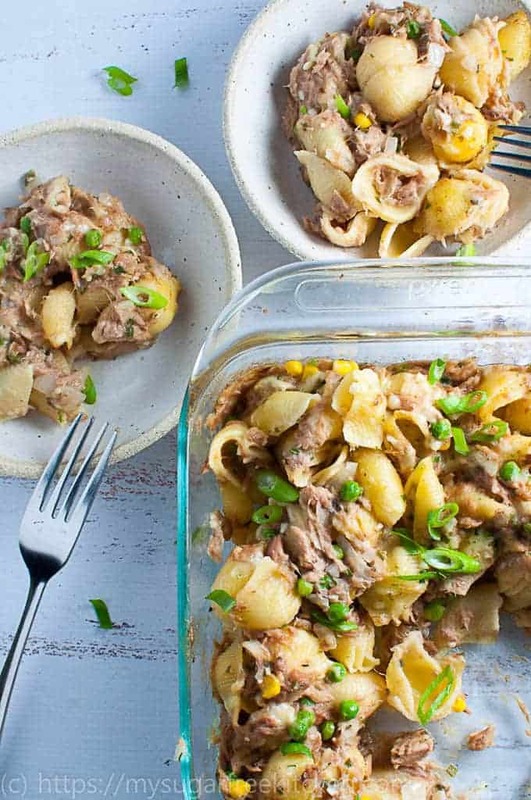 Making Tuna pasta bakes and tuna mornay always remind me of my time working in the fitness industry. Unfortunately the same can’t be said for Mr T. He does not like it at all, and I am under strict instructions to only make it when he is away at work. So when he is away for his seven days at work, I make Tuna Mornay and turn it into a Tuna Pasta Bake! When I make this dish I want to keep it as healthy as possible which for me means no cream or milk. Not that I don’t eat those things, its just that I think that it’s not really necessary to create the creaminess I’m after. Actually I think that there is a better option than using milk or cream which is the cream of mushroom soup and the soup is what creates a lot of the flavour. This is my personal favourite way of making it, although you could use cream of chicken as well. Well, as Mr T is away this week, I will thoroughly enjoy tucking into my tuna mornay pasta bake. I might even just eat it for dinner four nights in a row, since it makes four servings! 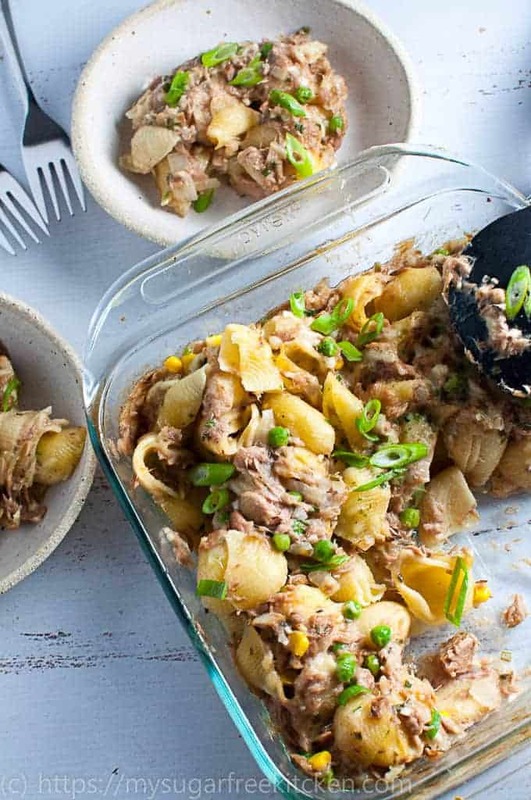 Not feeling the love for tuna at the mo? 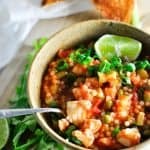 Check out my one pot moroccan fish stew – yep, on the table in 30 minutes! 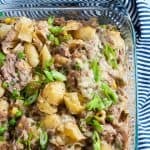 Easy tuna mornay pasta bake made with cream of mushroom soup. Tastes rich and creamy, but amazingly has no cream or milk! Lots of flavour with few ingredients. Perfect. Add to this, the second packet of dry soup mix, no extra water needed. This is to thicken the white sauce. Stir until it becomes thicker and reduce heat. Drain tuna of liquid from the tin and add to the saucepan of white sauce. Stir to combine. Add in the frozen peas and corn and stir for a further minute. Tuna sauce is done. Once pasta is cooked, spread it into an ovenproof dish. Pour the tuna sauce mixture over and gently turn over with a spoon to combine. Sprinkle with cheese and bake in moderate oven at 180 degrees C/350 degrees F for 20 minutes. 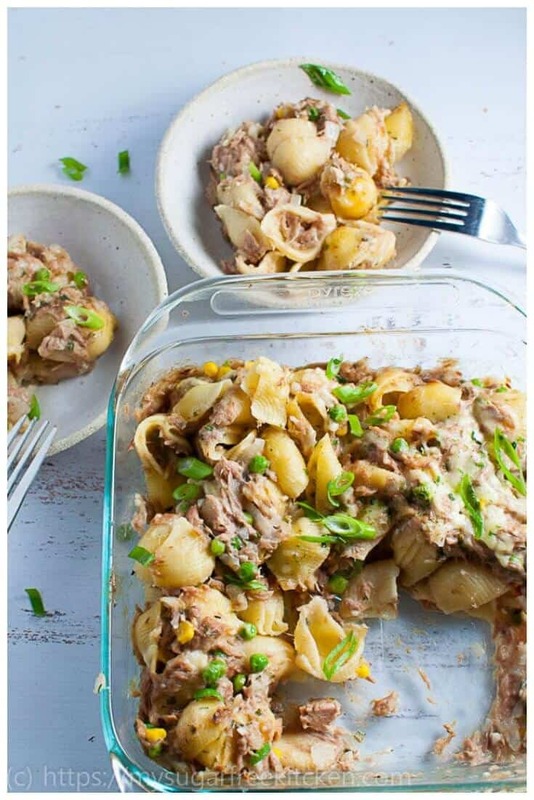 • This dish freezes well and can be stored foe upto 2 months in the freezer. • If you can’t find cream of mushroom packet soup, you can substitute with cream of chicken or any other type of dry packet soup following the same instructions as above.